This page provides introductory facts and statistics about obesity in New Zealand. For more information, refer to A Portrait of Health: Key Results from the 2006/2007 New Zealand Health Survey. Pacific men and women were two and a half times more likely to be obese than men and women in the total population. Māori men and women were one and a half times more likely to be obese than men and women in the total population. There has been an increase in the prevalence of obesity for men and women from 1997 to 2006/07, adjusted for age, but the rate of increase appears to be slowing. One in twelve children (aged 2 to 14 years) were obese (8.3%). One in five children were overweight (20.9%). There has been no change in the average (mean) BMI for children aged 5-14 years since 2002. There has been a decrease in average BMI for Māori children. Adjusted for age, Pacific boys and girls were at least 2.5 times more likely to be obese than boys and girls in the total population. Māori boys and girls were 1.5 times more likely to be obese than boys and girls in the total population. Nine out of ten (87.8%) children aged from birth to 14 years have ever been breastfed. Nine out of ten (87.8%) children aged 2-14 years ate breakfast at home every day in the past 7 days. Two out of three (63.6%) children had fizzy drink in the past 7 days. One in five (19.6%) children had three or more fizzy drinks in the past seven days. Seven out of ten (70.9%) children ate fast food in past seven days. One in seven (13.6%) ate fast food twice in past seven days and one in 14 (7.2%) had eaten fast food three or more times in past seven days. Two out of three (64.1%) children aged 5-14 years usually watched two or more hours of television a day. This equates to 368,700 children. Two out of every three adults (64.1%) ate the recommended three or more servings of vegetables each day, and two out of three adults (60.0%) ate the recommended two or more servings of fruit a day. One in seven adults (13.6%) reported that they were currently taking medication for high blood pressure. This equates to 425,500 adults. One in 12 adults (8.4%) were currently taking medication for high blood cholesterol. One in 20 adults (5.2%) had been diagnosed with ischaemic heart disease. The prevalence of diabetes in children was 0.2% which means that approximately 1700 children had been diagnosed with diabetes by a doctor (most probably type 1). One in 20 adults (5.0%) had doctor-diagnosed diabetes (excluding diabetes during pregnancy). This equates to 157,100 adults. Nine out of every ten adults with diabetes were diagnosed when they were 25 years or older, and almost all will have type 2 diabetes. After adjusting for age, Pacific men and women had three times the prevalence of diagnosed diabetes than men and women in the total population. Just under half of children (47.0%) aged 5-14 years usually use active transport to get to and from school (walking, biking, skating or using other forms of physical activity). Common reasons given by parents for what stops their children walking, biking or skating to school – live too far from school, busy traffic/main road, too dangerous for reasons other than traffic, takes too long. Half of all adults (50.5%) met the definition of being regularly physically active. Overall one in seven (15.0%) adults were sedentary, reporting less than 30 minutes of physical activity in the previous week. Like nearly every other Western (and non-Western) society, New Zealanders are putting on the kilos. The problem of obesity starts young in our lives, as we consume sugary, fatty, highly-processed foods – and usually ends in heart disease, diabetes, and early death. The last bit – early death – is usually the worst. Science is confirming what many of us had already intuited; that obesity was not simply a matter of “will power” or exercise – any more than “self-discipline” is for alcoholics or gamblers. There is much more going on, in the depths of our brains, that is affected by what we are eating – and vice versa. By June, 2008, the previous Clark-led government courageously attempted to halt the obesity epidemic. Despite being sensitive to criticisms of “nanny statism”, their policy was not to ban junk food throughout the country. Nor to force feed us with vegetables and fruit. And not to frog-march us up and down our streets with battalions of Exercise Police. Their plan was simply to cut crappy food out of our school ‘tuck’ shops. You would think that this modest proposal would have been welcomed by sensible people who understood the problem, and realised that what we fed our children early in their lives would have an impact on their later years? Sensible, right? Oh hell no. That would require common sense; foresight; and a strong sense of community responsibility. I wonder if Mr Gall considers it “heavy handed” when we deny our children access to cigarettes and alcohol? After all, if it’s “heavy handed” to try to provide healthier food options for our children, then let’s go hell-for-leather and give 10 year olds a six-pack of DB Bitter for breakfast. We can always try an “educational approach” later? Unfortunately for us – but more unfortunate for our children – this bizarre attitude of Individual Responsibility won out over Community Proactivity. The National Party was perhaps chief amongst culprits, as it began a smear campaign of “nanny statism” against the then-Labour Government. 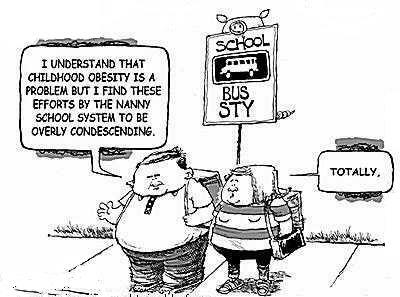 Gosh, and just think; if Labour has it’s wicked way, our kids might not become obese!! Shock! Horror! In November 2008, National was elected into power, and John Key became our Prime Minister. You have to read that article in it’s entirety to grasp the full flavour of lunacy involved in the ‘rational’ behind National’s decision. Riiiight. The same goes to allowing our children to have access to a couple of shots of bacardi as well? Oh no, because neo-liberal politicians know better than nutritionists. We are going to have Freedom of Choice Even If It Damn Well Kills Us (and our children). Essentially, that is precisely the message that National gave New Zealanders two years ago. Thank you, Dave “Common Sense” Ashby. However, leaving these matters to the whims of individual schools is not a solution. It means that some schools simply won’t bother; they will defer decision making further “down the food chain”, to our children. It certainly sends conflicting messages to the community. And National’s over-turning of Labour’s policy also shows a total lack of any measure of leadership on this problem (I refuse to call it an “issue” – it is a problem). Our reasons for opposing removal of the clause follow. The Minister, Hon Anne Tolley, states that the core business of schools is to provide students with a “quality…learning environment”.1 Students cannot be expected to benefit fully from such an environment if they are inadequately nourished or experiencing poor health because of poor nutrition. Research suggests that good nutrition is associated with better overall school and academic performance, intelligence, and psychosocial functioning.2–4 Thus, a healthy school food environment seems imperative for a quality learning environment. The Minister states that boards of trustees can “make their own decisions about appropriate food and drink options”.1 However, the reason the clause was introduced was that school food under boards of trustees was not sufficiently nutritious. A study in 2007 by Utter et al showed an association between use of school canteens in New Zealand and more frequent consumption of high fat and high sugar foods. 5 An earlier study by Carter et al found that the most commonly available foods in primary schools were pies (79%), juice (57%), and sausage rolls (55%).6 There were over five times more unhealthy meals on offer than healthy meals, and filled rolls (a healthy option) were the most expensive item. It is unrealistic to expect boards to have the detailed nutrition knowledge necessary to ensure an appropriate and healthy food service, especially with their already heavy workload. The Minister’s decision means that whilst schools are still required to promote healthy foods, they must determine what foods are healthy and, of greatest concern, can continue to sell unhealthy food. This is contradictory and suggests ‘do as I say, not as I do’ to children. Relying on nutrition education alone also assumes there is free choice in school canteens. However, food choices are constrained by the environment. If all that is available is food that is unhealthy and heavily promoted in the media, or if healthy foods are more expensive, then students don’t have a true choice. Furthermore, younger children can not be expected to make rational choices about food based on health. Development and implementation of the Ministry of Education’s guidelines on ‘Food and Nutrition for Healthy, Confident Kids’9 was the result of a prolonged and extensive amount of work on the part of government, schools, health sector, and the food industry. That expense and resource was well justified given the potential long-term gains, but has now been completely wasted, without even evaluating its potential success. The fact that children bring unhealthy food into school or buy it out of school is not, as has been proposed, a reason to allow unhealthy food to be sold at school.1 The same rationale is not accepted in other circumstances. For example, it could never be acceptable to allow cigarettes to be sold at school because students could buy them at a local dairy. Whereas at one time New Zealand was seen as a global leader in our efforts to tackle obesity,11 this latest move by the National government puts New Zealand seriously out of step with other countries. The UK Government, for example, is making laudable efforts to tackle childhood obesity, including implementing regulations around school food, and embarking on plans to broaden the reach of such regulations to include other key environments such as restaurants and workplaces. The future cost to the country of obesity and nutrition-related disease is immense.12–14 It is of the utmost importance that we support young people to develop healthy eating habits as they grow. This requires environments that support healthy food choices. The current rates of childhood overweight (21%) and obesity (8%) show that existing environments are not conducive to healthier choices.15 Government intervention is justified to protect children and to prevent the high societal costs of nutrition-related disease. This does not make New Zealand a ‘nanny state’, but simply a caring state. Now, you’re probably wondering; why should I accept the statement of the people above, rather than my democratically elected representatives? It’s very simple. The people above are trained in matters relating to health. Their #1 concern is mine and your well-being. That is why they went to University; spent years and thousands of dollars being educated; and why they took time to make their views known to you. In short, they care. The people who over-turned Labour’s National Administration Guidelines for healthy foods are politicians. They care only to be re-elected. Or put another way, who would you trust to look after your health; your GP? Or the Minister of Health, Tony Ryall? Your call. “The new Government has a more balanced approach than the finger-pointing, nanny state attitude of the previous administration,” he said. “Nanny state attitude”, remarked Mr Ryall. More politicking. What was it I said about who to trust; health professionals or politicians? By now you are probably wondering why on Earth our political representatives in Parliament would ‘can’ Labour’s healthy foods policy for schools – which costs very little for the taxpayer to impliment – whilst committing $8 million dollars for 300 bariatric procedures (weight loss surgery) in the next four years? What possible sense is there to such a bizarre situation? In terms of health outcomes and sensible use of tax-dollars – very little sense. In terms of political appearances to be Doing Something – it makes perfect sense. By scrapping Labour’s healthy foods policy, National gives the appearance of rejecting “nanny statism” (though National has passed, or assisted, similar legislation in the past – such as the so-called “anti-smacking Bill), and reinforcing the Rights of Individuals to “make their own decisions”. By funding 300 bariatric procedures, National is seen to be Doing Something to address this nation’s obesity problem. Above all, politicians understand that the public’s perception must be influenced: politicians need to be seen to be Doing Something to address a problem. It is precisely the reason why “boy racer” legislation was passed by National – despite police already having considerable powers to seize cars and arrest drivers. The point was not that new laws were needed – but politicians had to be seen to be Doing Something. The reason why National could not rely on Labour’s healthy foods in schools programme? It would not have offered the immediate results that politicians require. 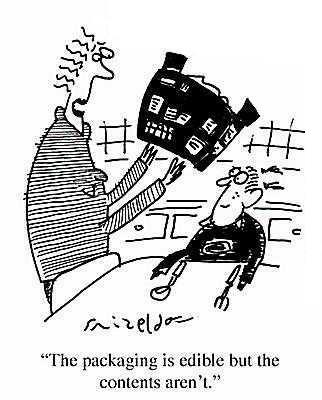 Such a programme takes years – decades! – to show results. Politicians face re-election every three years. That’s right, folks. Not only are we spending more money for weight-reducing operations – but the patients are becoming younger, as obesity increases in our society. So now companies are making a profit out of the growing obesity epidemic. 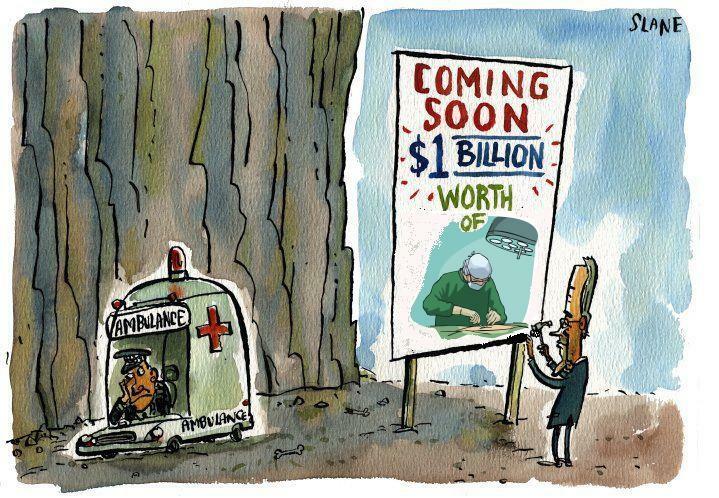 This, no doubt, fits in very well with National’s core ideology of encouraging private “providers” for our health needs. Someone will be making a lot of money out of peoples’ misery. This is how obesity impacts on us, as a society, and as individuals. As obesity gets worse, we will end up paying more for hospitals, surgical procedures, medicines, post-surgical care, etc. … but balks at removing unhealthy food from school cafetarias. Obviously, National has forgotten what their grandmothers and grandfathers knew instinctively; a gram of prevention, is worth a kilo of cure. I guess their imperative for re-election outweighs simple common sense? Little wonder that we distrust politicians. There are those in society who are vocal in their insistance that obesity is an “issue of personal responsibility”, and not something for the State to be concerned with. I reject that philosophy utterly. We are a community, who rely on each other for everything that we have. None of us achieved or gained anything on our own – someone, at some point in time, helped us to get to where we are today. When it comes to the obesity epidemic, this is a problem that affects us all; whether in the taxes we pay, or a family member directly affected. Or ourselves. We need to remember this, the next time a Minister tells us that it is a matter of “choice”. If it is “choice”, then we should be choosing to have sensible, proactive policies when it comes to food for our children – and not just leave it up to individuals. For children, that does not always work. And eventually, that “choice” will lead to a “choice” whether to have an expensive operation or not. And yet, with a bit of common sense and prevention, we ultimately wouldn’t be needing those expensive new hospital wings, and surgical weight-loss procedures. Q: Why did the fat kiwi cross the road? DJ Key talks cats, not tax on radio show – NOT a joke! This is why our Prime Minister is on a salary of $400,500 – so he can talk about cats. This is a good thing, no doubt. After all, who wants to talk about the state of the economy; high unemployment; lack of jobs; the impending second international economic melt-down; asset sales; sale of farmland to overseas investors; etc? Them is boring stuff, fellas. Here in Nyu Zild, we is kat luvers. Question to those 50% of New Zealand voters who think that John Key actually knows what the heck he is doing: why?! The man has his hands of the economic tiller; we are drifting without any substantial job-creation policies; he plans to sell half our electricity companies to Americans, Chinese, and god-knows-who-else – and some of my fellow Kiwis still want to vote for him??? “…In 2006, then Houston police Chief Harold Hurtt strongly advocated citywide cameras (Hurtt is now in command of DHS’s immigration enforcement program). A controversial figure, Hurtt adamantly enforced don’t-ask-don’t-tell immigration measures that prevented officers from inquiring about a suspects’ immigration status. Houston is a staunch “sanctuary city” with a huge illegal alien population. The Video Camera Surveillance (Temporary Measures) Bill is currently before Parliament’s Justice and Electoral Committee. The Bill was introduced on Tuesday (27 September). It went to Select Committee Hearings on Wednesday (28 September). The closing date for submissions is Friday (30 September). The Select Committee must report back to Parliament next Monday (3 October). This Bill, if passed into law will allow police to secretly film people. We, the people, have one week to read the contents of the Bill and put together a submission for the Select Committee. One week. Despite Police attempting to spook the public with claims that “40 trials and 50 police operations are under threat” – one has to doubt the veracity of such a claim. It seems bizarre that all of a sudden, so many vital police operations are under threat. “I would be sceptical that any of those prosecutions exist. The Supreme Court had made it clear that the current law did not allow covert video surveil-lance – and the police knew this. “I have never encountered it and a number of my colleagues have never encountered it. I think it’s rare because it’s illegal. “That is why [the Urewera appeal] was thrown out: because the police acted in bad faith. It was thrown out because it was illegally obtained. Yet Crown Law and police were saying that 40 to 50 of their investigations and/or prosecutions could be affected if the law was not changed to allow covert footage – and make it retrospective. 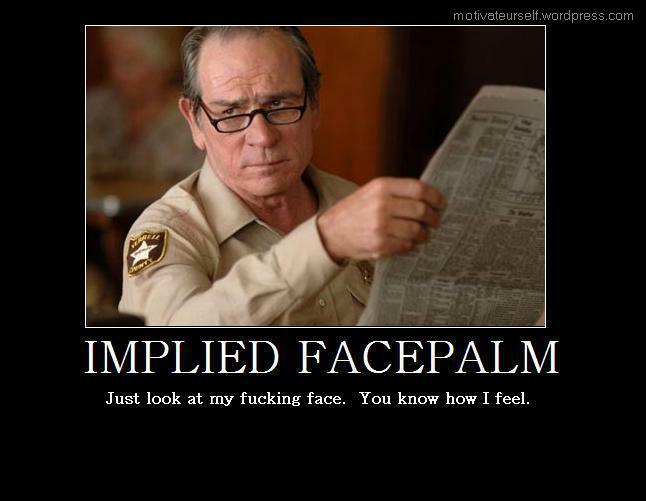 He added that, “under the Evidence Act, the courts already have the discretion to allow illegal evidence to be used in cases of serious offending”. Evidence that is “illegally” obtained is not automatically discounted as inadmissable by Courts. In situations of grave seriousness, such evidence may still be admitted by the Courts. Source. Why is this Bill a bad piece of legislation? It is not necessary. The Bill is more about Police (and the government) covering their backsides after the Supreme Court recent threw out illegally obtained evidence in the case of the so-called Ureweras “Terrorist” trials. The Courts can already accept illegally obtained evidence in certain circumstances. This Bill is being rushed through in one week. It is frightening that legislation that permits police to put cameras in peoples homes is pushed through Parliament at such incredible speed – thereby greatly restricting public in-put. Isn’t this kind of legislation precisely the sort of thing that National accused the previous Labour government for – and constantly labelled them as “Nanny State”? 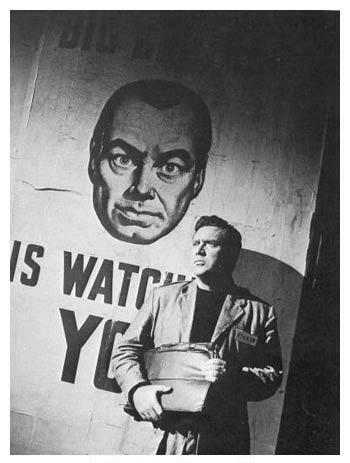 Isn’t this much worse – Big Brother State? The Bill itself is very short and simple. Read here. In fact, it contains no safeguards or controls whatesoever. It is simply a piece of patchwork that has been hastily cobbled together. Such law is invariably bad law. In the meantime, let’s hope that Houston police Chief Harold Hurtt’s vision of surveillance cameras in peoples’ homes never, ever comes to pass. But that’s up to us, folks. 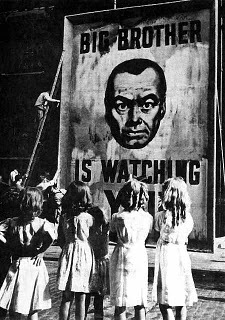 No one can stop 1984 from becoming reality, except us. Bread & Circuses, Penguins & Rugby. 8.08 – 815: Rugby. RWC. People with a rugby ball. Sick Jonah Lomu (ex rugby player). More rugby. 8.15: Christchurch earthquake. Meningitis case in Wellington. 8.16: Crime story in Dunedin. 8.21: Civil unrest in Yemen. Fire and fatalities in London. 8.25: Campaign against bull fighting in Spain. (True! No bull!) Crazy US stuntman in China. Followed by Weather today. Followed by International Weather. (Raining in Botswana, I see – fishing trip cancelled tomorrow.) Then TVNZ7 station break. 8.39: “Coming Up Soon” announcement. There we have it, folks: fifteen minutes of rugby leading a supposedly “serious” TVNZ7 news hours – with another 15 to 20 minutes of same, at 8.40. By comparison, the global financial crisis – which threatens the entire planet with another Depression and collapse of entire governments – lasted five minutes. 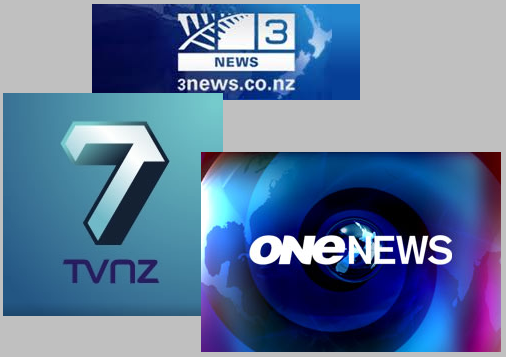 Though this information was collated from TVNZ7, the other two television news serices, TV1 and TV3, have been likewise guilty of trivialising news reporting. Theresult is that we, as a society, are less well informed as to what is happening in our own country, and indeed the world. This is perhaps a matter made even more critical as we have a general election looming and the global economic crisis seems to be gathering an evil head of steam. We also have a piece of legislation called the Police Surveillance Bill currently before the House – a proposed law that could make New Zealand one of the most surveilled country in the Western world. 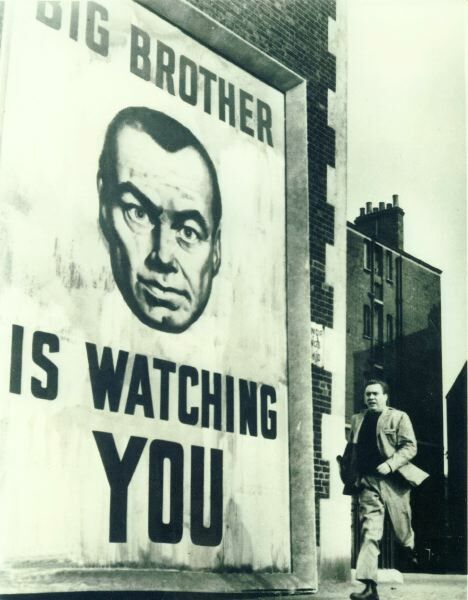 Big Brother has taken a step nearer. All this is practically “invisible”. The news media has practicalled muzzled itself, as it chases the Rugby World Cup, and cute animal stories. Now I’m as happy as the next bloke or blokette to have TV news cover the RWC. No, honestly, I am! But not at the expense of general news; politics; the economy; community; and international affairs. There is a time and place for everything and the News media have a responsibility to inform New Zealanders what is happening in their own country. There is more to our lives than a 15 minute story on the All Blacks thrashing [insert other rugby team here], and then a human-angle story on one of the All Blacks’ mum and dad. Otherwise, this isn’t just “dumbing down”, this is a pre-frontal lobotomy of the electronic media with an ECG charge of 5,000 volts to the temples, for good measure. 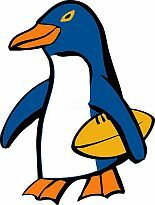 Welcome to Bread and Circuses, 21st Century style – instead of Christians and Lions, we have penguins and rugby. What date will the coming General Election will be held on? Which party proposed a Capital Gains Tax? There are NZ military staff in which country: Iraq, Libya, Fiji? If you don’t know the answers, but do know who will be playing the next match, then ask yourself why? The government has ordered Auckland University to cease political protest action. Government minister, Steven Joyce yesterday decreed that “my general advice to NZUSA (NZ Union of Students’ Associations) on the cost of living for students is to keep your heads down”. PROTEST: Police on standby at Auckland University after students took over the business building. Joyce further added, “I think most New Zealanders think students are reasonably well looked after at this point in time”. This is true: university students currently have much of their tuition fees subsidised by the State. And their student loans are interest free. However, the Minister for Tertiary Education forgot to reveal to the NZ Herald that he recieved a free tertiary education. No student fees. No student debt. It was all paid for by the tax-payer. So, it seems rather curious that Mr Joyce, who benefitted from a free, tax-payer funded, tertiary education, with no debt incurred from his tuition – can order fee-paying students to cease all political dissent. Another case of a Baby Boomer telling Gen X to “do as I say, not as I do”? Greece is close to defaulting; the Eurozone faces collapse; the United States owes over $14.3tn (tn = trillion) in debt; and now China is facing economic problems. Despite a new crisis confronting the world economy, John Key is still showing his vacant optimism? Either he knows something that the rest of the world doesn’t – or he’s grinning and hoping the election will be over before the next global economic “crunch” hits us. This vacant optimism extends to cutting 170 teaching positions from quake ravaged Christchurch, as well as throwing over two thousand government workers onto the unemployment scrapheap. These are the people who make government “tick”, including those at DoC who are charged with protecting our environment – so we can market ourselves as “Clean & Green” to overseas visitors. As for job creation, National has done very little in this area except for it’s much-vaunted cycle-way – which has created 215 new jobs – not the 4,000 estimated by John Key in May, 2010. The Job Summit, held in February 2009 (remember that?) produced nothing of worth. Cut the Training Incentive Allowance for solo-parents to pay for further education and career-training. This is the same benefit that Paula Bennet received when she was a solo-mother, and which funded her University course. Permitted youth unemployment to reach nearly 20%. 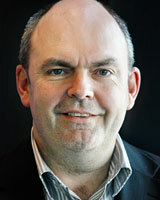 – despite promising a “Youth Guarantee” to allow full training for young New Zealanders. This never happened. Suggested that our low-wages, in comparison to Australia, was a competitive advantage. Cut $146 million from skills training. Plans to cut 170 teaching positions from Christchurch. Cut taxes twice, in April 2009, and October 2010. 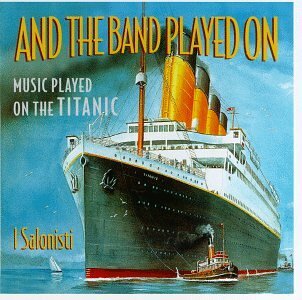 Borrowed in excess of $380 million a week, till we are $16.7 billion in debt. Permitted jobs to go to overseas companies, instead of local manufacturers, resulting in yet more job losses. Initiated no new job creation policies. With no job creation policies; National making government workers redundant; borrowing vast amounts from overseas whilst cutting cutting, John Key has left New Zealand vulnerable to the next economic shock. To illustrate: prior to the 2008 economic recession, our unemployment rate was 3.8%. Post-2008, unemployment more than doubled to 7%, since reducing slightly to 6.8%. With the next crisis looming, if we start the “ledger” at 6.8% unemployment rate; $16.7 billion in debt; and no policies to fund job creation – then matters will only get worse. We simplyhave very little room remaining to manouver when the next crisis impacts on us. National has relied on “market forces” to create jobs – the very same market forces that have crippled the Eurozone and United States, and are now starting to affect China. Which is why Alessio Rastani’s comments in the Youtube clip above, are so frightening – frightening because we have squandered three years to plan and prepare for this eventuality.